When it comes to choosing the right tuner, there are many important considerations to remember. The types of devices you might need, as well as your budget level, the tuning method you’re used to and your skill level will all be contributing factors in determining which type of tuner you should opt for. The first thing you’ll want to look at is the type of device you need. As technology continues to evolve, and newer, more ingenious devices appear on the market on a constant basis, you will definitely have to keep up with the leading edge. The following are considered the three most essential types of tuners that experts would recommend in this day and age. Clip-on tuners are designed to clip on to your instrument and help you tune your ukulele at short notice, even in a noisy environment, or while other musicians are also tuning their instruments. Clip-on tuners feature a unique design with a vibration sensor that transmits the instrument’s vibrations to the circuitry responsible for facilitating the tuning process. One of the main benefits of these tuners is that they don’t use a microphone, so they are completely immune to background noise. Microphone based digital tuner devices are available as a portable and more universal alternative to clip-on tuners. They can often be used on a variety of instruments, and some also include additional electronics such as a tone generator or a metronome. The basic principle that these tuners are based on is the detection of sound through a microphone and display the note along with any necessary information for making the right tuning adjustments. Tuner apps make use of advancements in mobile application technology to bring you the easiest tuning experience through convenient Android and iOS apps. The apps can be used with a number of different tuning methods, and you can adapt their settings to your specific preferences. Also, many available apps can be downloaded and used free of charge. Clip on tuners have a great advantage over other types of tuners, since they can eliminate the noise and hassle associated with tuning an instrument. That often translates into higher accuracy and faster results, even in extreme cases, when you can barely hear your uke over the surrounding noise. Snark’s SN-5 tuner is a cutting edge device you can attach to a guitar or a ukulele for excellent tuning results. The sleek, easy to see tachometer-style display and the remarkable accuracy of the tuner are among its main advantages. Once you tune the strings, there is no change along the fingerboard, and the pitch is correct regardless of which note you try. Also, unlike most tuners, the Snark is incredibly sensitive, registering vibrations even if you just lightly touch the strings. A fast, reliable, accurate tuner with bright, easy to see display, the KLIQ UberTuner is a state-of-the-art device on the leading edge of clip-on tuners. The technology is designed to be extremely easy to use. All you have to do is clip it on your uke, and you’re ready to go. Its strong and durable construction is also one of the main benefits displayed by the KLIQ tuner. Past buyers agree almost in a consensus that the UberTuner is one of the most accurate and efficient clip on tuners currently on the market. When it comes to microphone tuners, you have to be quite careful in determining which devices are best and which of them has most to offer for the money. The following device is considered to be one of the best models on the entire market. The KLIQ MetroPitch is a 3-in-1 device incorporating not only a versatile digital microphone tuner, but a broad-range tap tempo metronome and a versatile tone generator. Small enough to fit in your pocket, it features a smart design and features like an easy to read digital screen and an intuitive JOG dialer for convenient tempo adjustments. The tuner itself is highly accurate, and displays notes ranging between A0 and C8, while also allowing for several tuning modes and advanced pitch calibrations that are ideal for tuning ukuleles. If you’re looking for tuner apps, versatility and ease of use are the main benefits you should look for. The following app is considered to be one of the best for ukuleles specifically. The Easy Ukulele app for Android is a tuner app designed especially with ukes in mind. The app is highly popular, with thousands of 5-star reviews, and it’s designed to offer a simple alternative to tuning your ukulele with the help of elaborate electronic devices. Part of a series of tuner apps that use advanced probability theory and Fourier Transforms, this specific app was designed with ukuleles in mind. Whether you’re a beginner or an advanced player, you can figure out how to use it within seconds, and get all your strings tuned just right in record time. Aside from having a good tuner, it’s also important to know how to tune your ukulele properly. With a well-tuned uke, you’ll not only sound better, but you will also get a better sense of each note, improving your musical skills as a whole. Most ukes are tuned in the standard ukulele tuning. Tenor, concert and soprano ukes are all tuned using this method, also referred to as C tuning. 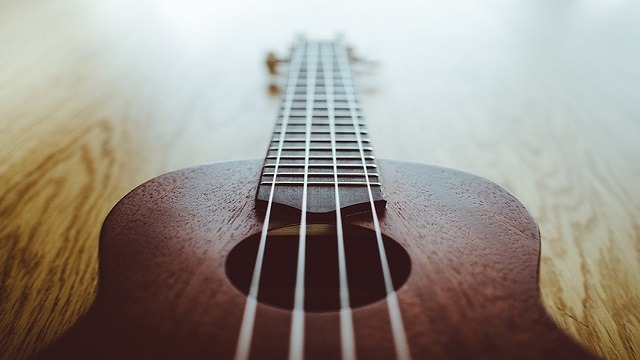 To use C tuning, you have to tune the top string of your ukulele to a G, then move to the third string to tune it to a C. The second string has to be tuned to an E, and finally, the first string completes the set with a clear A note. Aside from using a tuner, an alternative method to tuning your uke is to use the opening line of the song My Dog Has Fleas. That is because the line has the identical notes you will need for standard tuning. There are several other types of tuning you can also consider, including the baritone ukulele tuning (D, G, B, E) and the slack-key tuning method (G, C, E, G). As you progress from beginner to intermediate level, you’ll find much greater variety when it comes to tuning, and you will discover methods like the English and Canadian tuning, as well as learning the basics of how tuning is influenced by the material, level of quality, thickness and length of your strings.